This is just a little site with some information about my car. 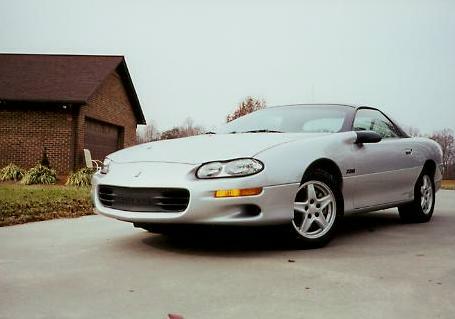 I go by the name CrazyQuik on some of the web forums about cars, and when I got a Sebring Silver Z28, I decided Silver would be a great name for it. Links to other pages in my site below. 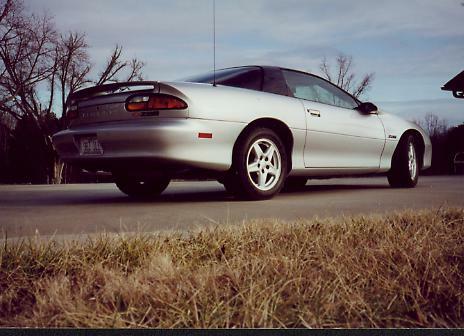 This Camaro, while its VINed as a 1998 was ordered in May of 1997 and delivered in August of '97. This makes it a very early production car. It it equipped with only 3 additional charge options, the 3.23 Performance axle ratio, the Z rated tires, and the 1LE Handling package. It's also equipped with an automatic transmission. Of the 99 1LE Camaros made in 1998, only less than 15 had an automatic transmission as this package was intended for road racers and autocrossers. "Win on Sunday, Sell on Monday" is often heard when speaking of auto racing, and this package was built primarily to beat Mustangs in Showroom Stock road racing when it first appeared in the late '80s. As the package evolved it became more streetable (versions untill '96 had no air conditioner or radio). It includes a power steering cooler, aluminium drive shaft, firmer suspension components, a firmer tranmission mount, and double adjustable Koni shock absorbers. The car is a very low optioned to keep weight down, so what you find common in most 4th generation Fbodies is absent here. Also, ordering the 1LE option deletes the front fog lights, which is the only exterior difference. Currently the car weighs 3195 pounds with the back seat and front swaybar removed, or roughly 3240 pounds with them. Documents sent from GM to the dealerships list RPO 1LE as "engineered specifically for professional racing and intended for serious performance enthusiast only." I have specific information about the 1LE package listed on the bottom of the More Pictures page. LS1tech.com is IMO the best online forum related to technical discussions of the GM Gen III small block. This is the page for performance enthusiasts. For more information about 1LE equiped cars.